Or, better yet -- gift some to a friend, a work colleague, customer, supplier, employee, or Canadian Troops Overseas! The entrepreneurial spirit is alive and well in Scouting. The youth, boys and girls, from ages 5 to 75, of the 1st Binbrook Scout Group are selling popcorn again this year, as our primary fundraiser. Working with us, you will be directly supporting youth within our own community. You will be giving a gift that not only tastes great, but also clearly identifies you as a supporter of the largest youth movement in the world. Let me further assure you as an involved volunteer, that all profits remain here for our use with the youth directly. This is truly a win-win-win, situation. Very tasty, very edible, and extremely hard to put down. Grown and manufactured in North America. Directly youth supportive, with no admin overhead. …and carries none of the stigma or waste, of some past traditional holiday gifts. Uniformed youth will deliver the popcorn during the week of November 24th, to your home or place of business. Or, as an option, we can also deliver directly to end recipients in the case of larger orders, if that is your desire. We are happy to include a special gift note from you as well. Scouts Canada is a registered charity, but the founder of the Scouting movement always said that a Scout should never beg. They should be willing to work for any money, or sell worthy goods for a reasonable price, in order to raise funds for activities and adventures. That is our goal today, and a value we continue to instil. All products, except Microwave Popcorn (which contains milk ingredients only), are produced in a plant that manufactures and handles products with peanuts, tree nuts, wheat, soy, and milk. The Chocolate Lovers Collection is now available in a new decorative gift tin. The Sweet & Savoury Collection has a new and improved flavour. The Cheese Lovers Collection is made with Canola Oil and real cheese. Kettle Corn, 18 pack - Our deliciously sweet and salty Kettle Corn is better than ever! Unbelievable Butter, 18 pack - A customer favourite with more buttery flavour than ever before. Butter Light, 18 pack - Our lightest butter popcorn with new and improved flavour. I don't really need any popcorn, but I want to support the effort of the Scouts, how else can I do that? As a registered charity, we would be happy to accept your donation, and can issue a tax receipt in return. Please contact us at the email below. 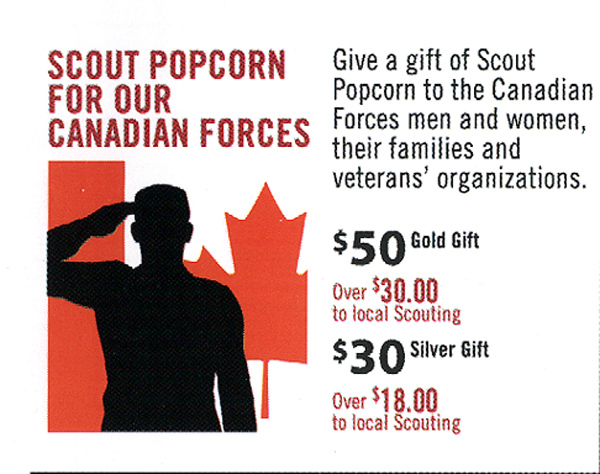 Or, starting in 2011, you can buy Scout Popcorn through us, that will be shipped to Canadian Forces Troops, on your behalf. I'd Like to give to employees/customers/suppliers, or know someone who might...? We can help you contact them, or would appreciate an introduction. Click here, for a generic letter we have created, or get in touch for a specific approach. www.scoutpopcorn.ca is the central website for Canada, operating under www.trails-end.com, and all is grown and made here in North America by the Weaver Popcorn Company. 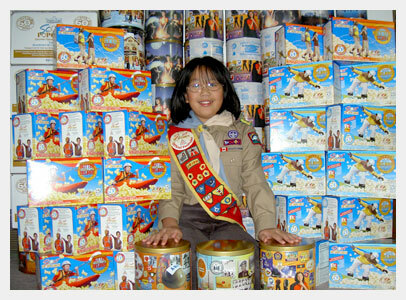 Who, interestingly enough apparently makes 25% of the world's popcorn, and Scouting accounts for 35% of that! This isn't the absolute cheapest Popcorn around, how come? It is after all, a fundraiser, directly supporting youth in our community. We accept cash, cheque, PayPal, and all major credit cards. Scouts Canada, 1st Binbrook Group. Click the Gallery link to the left, if you want to see their smiling faces in action. How do we order or ask more questions? Email popcorn@1stBinbrook.org with any questions or orders, and we'll happily take care of you. If you've been sent here by a youth you know, please be sure to include their name, so that they can get the credit for your order.